Plus - $83.99 Queen - $83.99 Only 1 left! "Listen sister if I want your opinion I'll beat it out of ya'." Every woman knows what it's like to be hit on by someone they would rather just leave them alone. They always seem to travel in pairs. Ready to jump on the any lady sitting by herself. Even when she has that "leave me alone" look. They never get the hint. But, if we all had Elvira's wit, and way with words, we would never have to put up with lecherous guys again. Heck, we wouldn't have to put up with much at all. Not the police. Not the nosy neighbors in town. Not crummy bosses. We could go to Vegas, and have our very own show on the Strip. And we could have the best eye make-up ever. 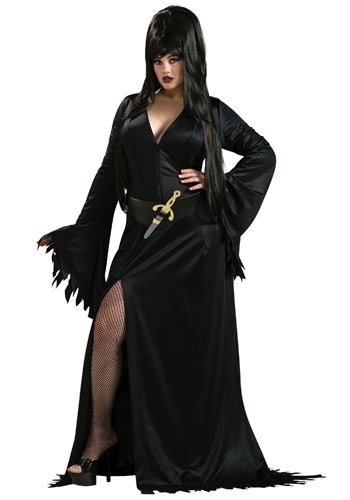 With this Plus Size Elvira Costume you can be the spooky, sassy, and fabulous Elvira: Mistress of the Dark. Just memorize her sassy lines from the movies, and her sultry dance moves. You'll be sure to put every guy who harasses any woman in his place, by remarking about how hard it is to see a certain something, something without your microscope. Or, when a crotchety lady tries to tell you what you can, and can't wear, you wont be intimidated by them. You will wear what you want. And you won't be timid about speaking your opinion in this costume. Or letting someone know you don't want theirs.